The IC’s control circuit and the LED share the same power supply. ensure that the waveform distortion of the circuit will not accumulate. Built-in Power-on reset and Power-off reset circuits. display, its scan frequency is higher than 400Hz/s. The reception and decoding of cascading data can be completed by a Serial Interface. Any two transmission distance not more than 3 Meters, without adding any circuit. When the refresh rate of 30fps, cascade numbers are not less than 1024 points. Data transfer speeds up to 800Kbps. Highly brightness consistency, and cost-effective. Full-color module, Full-color flexible strip. effectively ensuring the pixel point light color height consistent. making the pixel cascade number is not limited the signal transmission, only depend on the speed of signal transmission. 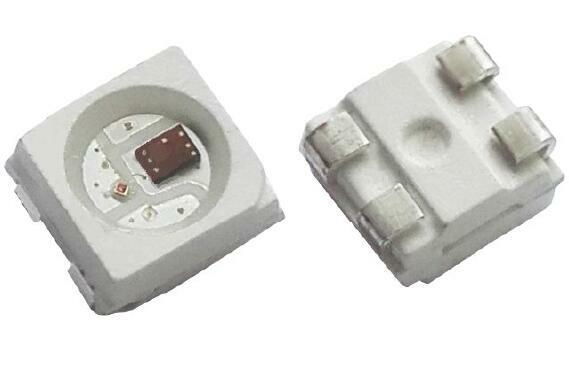 moresimplecircuit, small volume, convenient installation.